In war, heroic action stands shoulder to shoulder with atrocity both on the battlefield and at home. While war stories often focus on combat deeds, civilians also fight for their countries in ways that may be more subtle than but equally as dangerous as picking up a firearm. 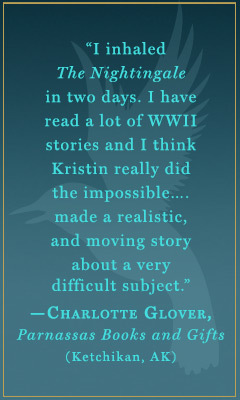 In The Nightingale, Kristin Hannah envisions the stories of two French sisters who take different paths to heroism in World War II, one plunging into the war effort as a French Resistance operative and the other trying desperately to survive and protect her daughter. "In love we find out who we want to be; in war, we find out who we are." In 1995, an elderly, terminally ill Frenchwoman now living in Oregon prepares to move from her home of 50 years to the nursing home where she will spend her last days. Now, few possessions retain their importance, but she will take with her a trunk containing assorted mementos and a set of false identity papers from World War II Occupied France. Her adult son humors her, and she regrets for the first time that in always emphasizing her husband's role in the war, she never told her son about her own war, or her sister's. Fifty-six years earlier, in post-World War I France, Vianne and Isabelle Rossignol have nothing in common but blood. Their father, a traumatized war veteran, lost interest in both girls after the death of their mother. The elder sister by a decade but still only 14, Vianne was expected to play mother to Isabelle. When Vianne married her sweetheart Antoine at 16, the young couple initially took Isabelle in, but Vianne found herself unequal to the task of raising her sister after a tragic miscarriage left her prostrate with grief. More than 10 years later, Vianne enjoys a simple life with Antoine and their eight-year-old daughter, Sophie, in Carriveau, where she teaches school and Antoine works for the postal system. Isabelle, now 18, has spoken her mind at finishing school and been expelled--for the fourth time. When World War II breaks out, the men of Vianne's town are called to the front lines, and Antoine is no exception. Thoughts of how the Great War changed her father swirl through Vianne's mind, mingling with fear for her husband and anxiety at being alone, but "What was love when put up against war?" Isabelle, too young to remember their father as anything but cold and distant, finds her imagination captured by dreams of serving her country as an ambulance driver or code talker, telling a male friend, "I could be a war hero," an idea he categorizes as "absurd" due to her gender. When the German occupation of France begins, Isabelle flees from Paris to Vianne's house at Carriveau, narrowly surviving aerial machine-gun fire in the countryside. The sisters immediately clash, Isabelle galvanized against the Germans by her experiences, Vianne determined to keep her head down and try to maintain as normal a life as possible for Sophie's sake. The Germans arrive, "looking more like tourists than conquerors," and the sisters' relationship grows increasingly tense when a German officer billets at their house, giving Isabelle a target for her vitriol and leaving Vianne to keep the peace. As the conflict between countries grows and Isabelle becomes secretly affiliated with le Resistance, the rift between siblings widens until reconciliation between them looks as unlikely as could be. 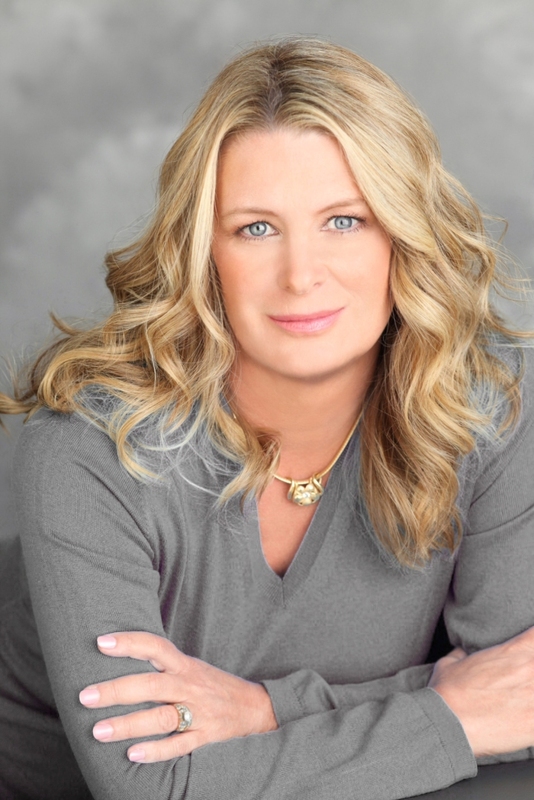 Kristin Hannah is the New York Times bestselling author of 21 novels, including the blockbuster Firefly Lane and #1 bestsellers Night Road and Home Front. She is a former lawyer turned writer and is the mother of one son. She lives in the Pacific Northwest and Hawaii with her husband. Kristin recently talked with us about love, war and life as an uber-geek. Why is it important to tell stories about women who get left at home during wartime? I didn't realize for a lot of my life how fascinated I have been by the stories of women, especially women in combat. I think a big part of it is that women's stories are so often overlooked, forgotten or overshadowed by men's stories, and we as women have just as many heroic, courageous stories to tell. Sometimes it's more courageous to stay at home and try to keep your children safe, and to make the choices that need to be made in pursuit of that. It's important that we remember the contributions that women make. Where do you feel this story fits in with the rest of your work? Interestingly enough, this book is both part and parcel of what I do, and also a huge departure. I have for years been writing about women's issues, women's struggles, the arc of women during the course of their lives and extraordinary women, so to that extent, it falls in line with what I've done. But to take on World War II France is a real departure, and to have the bulk of the book be set in France during the war is a pretty substantial undertaking on my part. Just imagining this world was a big departure for me. How did you handle the research? It was daunting on so many levels, because this book covered the entire war from the beginning of France's involvement until the very end. I went about it the way I go about all research, which is to go from general to specific. You go from reading the treatises about Europe and Britain and the beginning of World War II, to France and the French perception and experience in World War II, and then the more specific individual things--the Resistance, the women, the memoirs, the concentration camps. It's from the specific books, the memoirs, that I tend to draw most of the experiences my characters go through. My books are about ordinary women in extraordinary times and, fortunately in this particular situation, there were a lot of memoirs written by women exactly like that. Tell me about character development. Putting the book together was difficult, but the biggest challenge was taking the armature of war, the timeline of what happened, and the truth of what was going on and still creating characters that were mine, that felt like they were real, that didn't feel like they were simply reacting to the war. I wrote a lot of different versions. There was a version where Isabelle and Vianne were best friends, but I realized that because of what I wanted to say about the two paths that women took during the war, these two women had to have conflict in their lives apart from the war. That was where I came up with the 10-year age difference, the difference in their past histories and the difference in their personalities. How did you keep Vianne sympathetic even as she tries to get along with the Nazis? We have so much information now. But what about when you didn't have all of this information and you didn't know how dark and dangerous and ugly this was all going to get? And you're just a woman who's trying to keep her head down, thinking that if I can just not draw attention to myself, we can get through this. I think that's a very human response. Vianne is representative of a lot of people, male and female, who at some point reach the bottom and have to face their conscience and say, "At what point do I risk my child's life for a stranger?" To me, that was such a powerful moment, the moment that Vianne would have to make a decision that she thinks she's incapable of making. I was constantly thinking of myself and my own son, and I never underestimated how difficult that situation would be for a mother. Would you say being a parent heavily influences your writing? I would say very often. Fear and hope are inextricably woven into parenthood, and those two emotions are so powerful. We want so much to do the best for our children, and we are consistently afraid that we are not doing our best, and that the world is just such a dangerous place. I'm constantly interested in how women respond to dark times and how motherhood makes them stronger, like those stories about how women can move a car to save their child. There are few things in the world other than motherhood that can make you that powerful in an instant, and I find that fascinating. A recurring theme in The Nightingale is family members who distance themselves from each other. I think the human condition is to be afraid of judgment, and with our parents, our siblings, our friends, there's always a part of ourselves we hold back because we are ashamed, or think that they'll be disappointed, or that we won't be well received, or there's something innately wrong with us. And yes, we have given each other the tools to talk about this, but I still think that there are deep secrets that people keep until they feel safe. It is incredibly easy to misjudge your parents and your siblings in moments that are important. You go forward your whole life reacting to them inappropriately because you don't quite understand what that moment meant. You've said previously that all your novels start out with mystical elements. Is that still true? I am an uber-geek. I read a lot of YA, I read a lot of spiritual stuff, mystical stuff, magical stuff, fantasy stuff. They are my favorite movies by far, they are among my favorite books, and so that is my default setting. I always begin with some woo-woo element, and it generally does fall by the wayside. Actually, the book I'm working on now for 2015 has a strong weirdness element, and I think it will stay, but we'll see. Nightingale is one of the few where I knew going in that what was happening was serious business, that this war was serious business, and I knew not to go in the supernatural direction with this one. Do you think you'll ever write a YA fantasy novel?